We have all come to love the Korean beauty trend of sheet masks. At first I didn’t think they were anything special. Once I started using them I got hooked. I really believe Korean beauty companies are upping their game and using more quality active ingredients rather than just filler oils and preservatives. These masks were sent to me by YUR Beauty after meeting them at the Cosmo Beauty Expo Seoul. 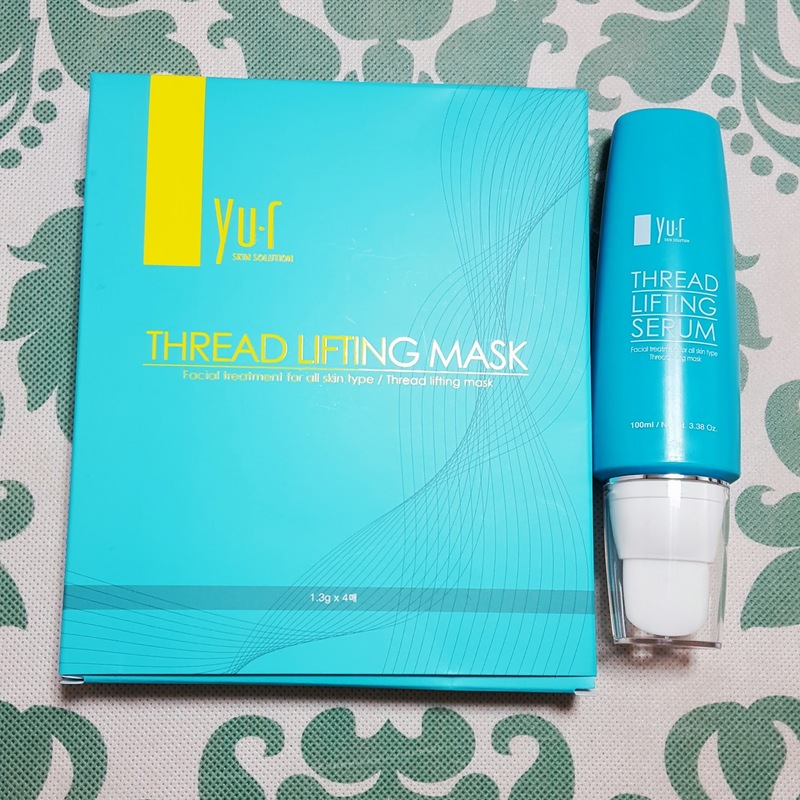 I was intrigued by this product because it was the first dry mask I had seen on the market. Most masks are sealed with serum already on them, so you simply apply the wet mask to your face. This mask is a bit different. With a clean face open the mask and separate the 2 pieces. One for your forehead, one for your lower face and chin. Spread a thin layer of serum on your forehead, then apply the mask, slick/smooth side down. Go over the mask with more serum so it is fully covered. 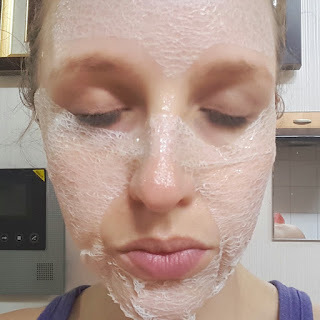 Think of it like paper mache for your face. Do the same thing with the lower face portion. The long strips go under your chin and up the side of your face. Pull these tabs a little tight around your chin for a lifting effect, then secure them with serum. Layer serum on everything and make sure the mask is stuck well on your face with little or no air bubbles. Leave on for 20-30 minutes (I leave it until it’s dried.) Peel away the mask and splash your face with water to remove any residue. Voila! This mask has a learning curve so high five if you do it right the first time! I’ve used it a few times and finally have the hang of it. The first time was an absolute disaster. It didn’t work at all. Second time was a little better. I used more serum but still didn’t stick to my face well and I didn’t see much result. The third time I put it on backwards (slick side should be on your face). Fourth time, I put the mask on the right way, and also used the paper mache technique. I could feel a nice lifting and tightening effect on my face. After rinsing my face my skin felt super soft. Not sure if my face “lifted” but it did feel really great. Save yourself some trouble, and follow my steps. After searching online, I also found some English instructions, but I like my personal modifications. There are a couple cons about the mask though. I didn’t like the actual fit or size of the mask. The forehead section didn’t fit mine very well (I admit I have a large forehead, but the section seems unusually small). The nose section is also very thin. I would like a mask that covers the full bridge of the nose. These are personal preference of course, but things I always look for in a good face mask. Have you tried the dry masks yet? 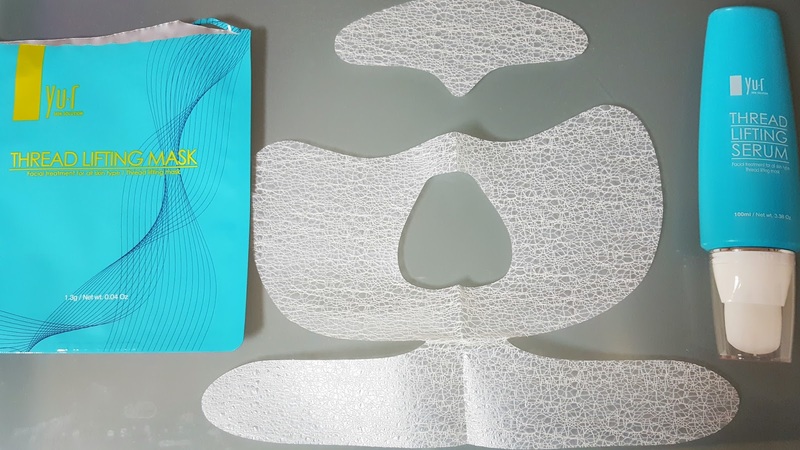 Since the expo I have seen a few different brands of dry masks popping up around Olive Young, but you can purchase these exact ones from Gmarket. Check them out and let me know what you think!